Maria, my niece, has always loved pink and lately she loves One Direction, too. Since her Mum gave me free rein over the design, and there was no way I was touching a One Direction cake--all the cakes I've seen have fiddly silhouettes, plus I'm a Metallica girl--I embraced the pink and went with a "Slice of Cake" design as I've wanted to do one for years. Luckily my friend Georgina made a similar cake recently so I was able to pick her brains about it. You can see her amazing cake (& tips) here! She warned me that the slice was a pain to crumb coat and then cover in fondant, so after I cut it from the thoroughly chilled cake, I shoved it in the freezer for about half an hour to set it further. This worked a treat, and the slice didn't wobble, slide or do anything impertinent when I applied buttercream! I used this tutorial to help make a large ribbon rose. It's trickier than I expected it to be--it took me ten goes to make this passable rose--but since I couldn't find my tub of gum tragrath I was unable to make a more delicate rose with beautifully thin petals. The rest of the cake decoration is pretty straightforward. 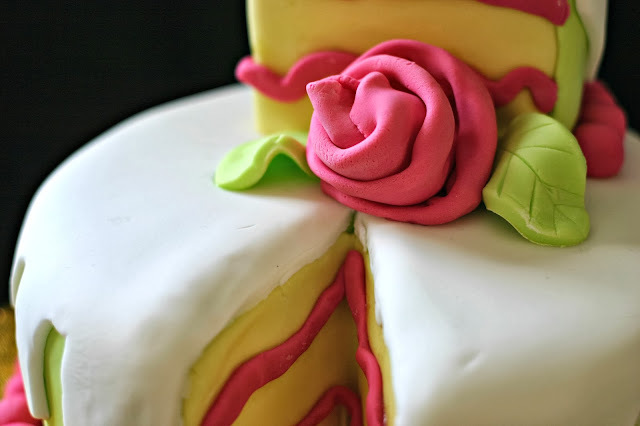 I'd suggest buying a craft knife just for cake decorating purposes to give you lovely neat edges--my wonky ones from a paring knife are still bugging me--when cutting the white fondant on top of the cake into scallops to look like poured icing dribbles. The jam filling lines were just thin sausages of pink icing, squashed flat against the sides of the cut-out area, with a slight wiggle, and I used a skewer to push it as far into the point of the cut as possible. I was really pleased with the finished cake. It looked like I'd imagined it would and I felt it was just right for a 10 year old--not too cartoonish and babyish, but not too sophisticated either. Most importantly, Maria (and her friends) loved it! From Nigella Lawson's "How To Be A Domestic Goddess". I baked three sponges to give a nice depth to the cake. Preheat the oven to 180C (160C fan oven). If the tins are loose-bottomed, you don't need to line them, otherwise do. Put all the ingredients except the milk in the food processor and process till you've got a smooth batter. Then pulse, pouring the milk gradually through the funnel till your cake mixture's a soft, drooping consistency. Pour and scrape the batter into the tins and bake for about 25 minutes, until the cakes are beginning to come away at the edges, are springy to the touch on top and a cake tester comes out clean. Leave the cakes in their tins on a wire rack for 10 minutes before turning out and leaving to cool completely. Beat the butter in a mixer until fluffy. Slowly add in the icing sugar--wrap a tea towel around the top of the bowl to prevent the sugar redecorating the kitchen--beating on a low speed. Once it's all incorporated, beat on a high speed until fluffy. Then, beat in the sieved berry jam until starting with 3T and taste. If the flavour isn't strong enough, then add some more jam until you're happy with it. Finally, if the texture is too stiff, add a few drops of cooled, boiled water and beat in well until you've got the right texture. Wilton gel colours: rose, a blend of lemon yellow and leaf to make a lime green, ivory and lemon yellow for the cake crumb. It looks great, and like you said, Maria loved it! I always watch those cake decorating contests on the Food Network. I wish I could do that. Angela this is absolutely fab! 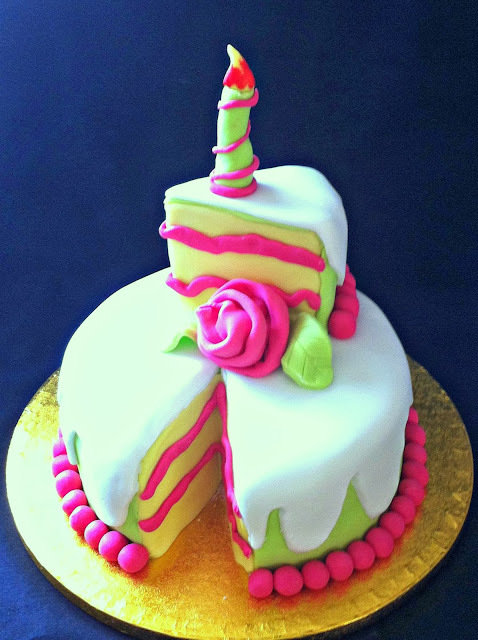 I'm going to have to try and recreate this cake for my friend's birthday!